I have been making kefir from the sheep’s milk I am enjoying from Grassroots Farm & Dairy. I have heard that kefir cultures are some of the most diverse microbial communities we can possibly ingest, and I find the kefir is a delicious and easy ferment to make. I obtained my starter culture from a friend, and I simply place it in a 1.5-pint mason jar filled ¾ full with fresh milk. I lid the jar, shake it well, then loosen the lid slightly, and place the jar inside my kitchen cabinet where it is dark, for about 12 hours. If I remember, I tighten the lid and shake the jar again about 8 hours into the ferment, then loosen the lid again and let it go for 4 more hours or so. I refrigerate it after this point, to avoid it total clabbering. 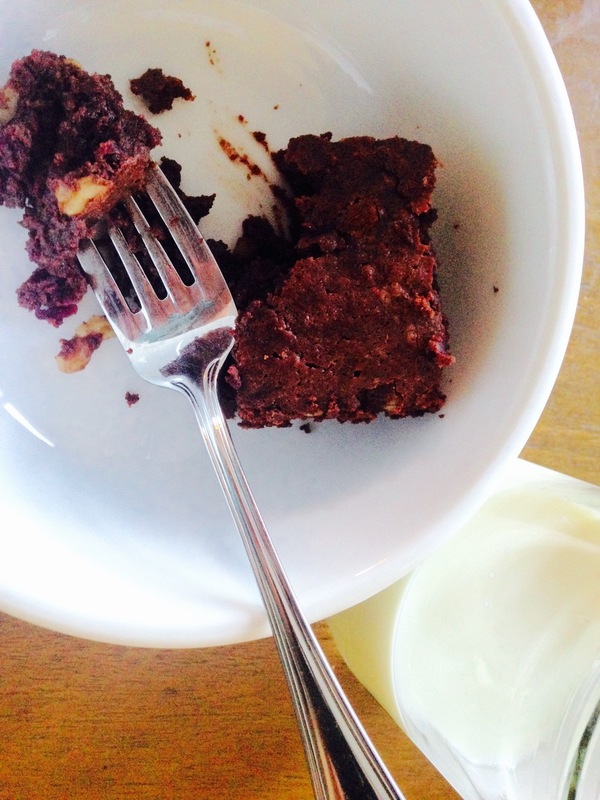 I’ve been enjoying the kefir straight (I strain it first), in smoothies, and in baked goods, as in these beet and chocolate brownies. When the cooked beets are cool enough to handle, grate them as finely as possible, or mash them thoroughly. Set aside. In a small saucepan, melt the butter and the chocolate together. Set aside. In a separate bowl, beat the eggs and the salt with a whisk or hand mixer, then add the sugar and vanilla and beat until creamy. Quickly and gently stir the chocolate mixture into the egg and sugar mixture, by hand. Add kefir or sour cream and beets. Then, fold in the flour manually, taking care not to overmix. Stir in walnuts, then pour the batter into a 9x9 inch baking pan. Bake at 350F until a toothpick inserted in the center comes out only a tiny bit gooey. Cool before slicing.